The production and sale of broilers, chickens, turkeys and eggs generated a total of $34.7 billion in 2010, according to the U.S. Poultry and Egg Association. The combined value of the sale of chickens alone was $72 million during the same time period. In addition to being big business, chickens are also valuable because of the role they play on the food chain, the nutrition they provide and the companionship they give as pets. If you are striving to be more healthy, you may want to choose chicken as an alternative food source to red meat. Chickens provide more than 67.6 percent of the Daily Recommended Value of protein, according to the USDA, and more than 72 percent of the daily requirement for Niacin in a 4-ounce portion. In addition, chicken meat contains a high level of various B vitamins and can even lessen age-related memory issues or Alzheimer’s disease. Eggs, too, are high in nutrition and protein and are a convenient, low cost food you can consume for breakfast, lunch, dinner or even a snack. Eggs contain B12, riboflavin and choline, which has been positively linked to development of memory functions in fetuses. In 2006, the American Meat Institute reported that Americans consume approximately 85 pounds per capita of chicken, more than any other meat product in the United States. Additionally, egg consumption in the United States in the 1990s averaged about 234 to 244 eggs per person, according to USDA estimations. This large consumption of chicken and eggs means many organizations and individuals rely on chicken for economic reasons. Among them are farmers, poultry processors and chicken-specialty restaurants, such as KFC and Chick-fil-A, which had $3.5 billion in sales in 2010. 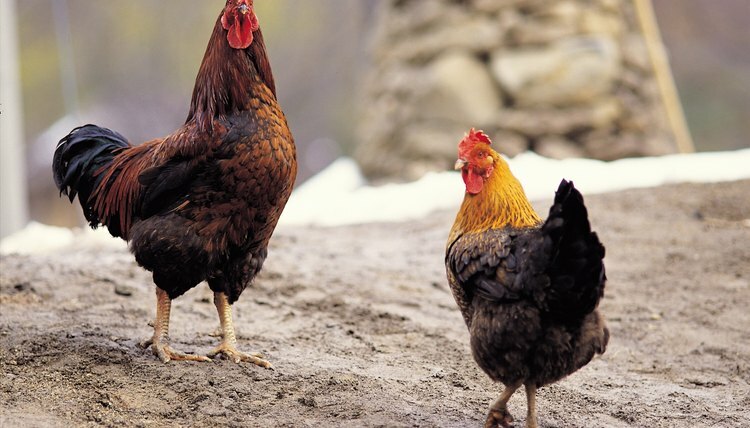 Chickens have been domesticated since 10,000 B.C. and are still kept as pets today. Keeping chickens as pets provides ready access to fresh eggs. Chickens can also live for up to 10 years, providing companionship for their owners. Further, according to "Back Yard Chicken Keeping: Myths and Facts," keeping chickens helps parents teach children both about where food comes from and about the responsibility of caring for animals. Like any animal, the chicken is a part of the food chain. Specifically, chickens eat unwanted insects, including ticks, slugs, termites, ants and pill bugs. Additionally, according to Back Yard "Chicken Keeping: Myths and Facts," you can use chicken manure as compost and fertilizer. Chickens also help to reduce household food waste by eating vegetable scraps.